Émile Zola photograph by Gaspar-Félix Tournachon (Félix Nadar). Émile Zola (April 2, 1840 – September 29, 1902) was an influential French novelist, the most important example of the literary school of naturalism, and a major figure in the political liberalization of France. 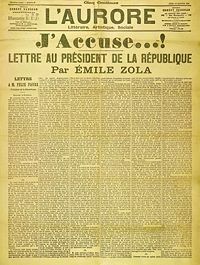 Zola risked his career and even his life to expose French anti-Semitism in the matter of the Dreyfus Affair with the publication of his open letter "J'accuse." His defense of Dreyfus led to a conviction for libel, yet he continued to speak out against this miscarriage of justice. Whereas realism seeks only to describe subjects as they really are, naturalism also attempts to determine "scientifically" the underlying forces (i.e. the environment or heredity) influencing these subjects' actions. In this concern one can see the influence of evolution theory of Charles Darwin and the discussion about nature versus nurture. Zola's naturalistic works often include uncouth or sordid subject matter. They had a frankness about sexuality along with a pervasive pessimism, and they dealt with the lives of ordinary people. Zola's many novels exposed the dark harshness of life, including poverty, racism, prejudice, disease, and prostitution, by which he focused on social problems with the hope of catalyzing social reform. Born in Paris, the son of an Italian engineer, Émile Zola spent his childhood in Aix-en-Provence and was educated at the Collège Bourbon (now called Collège Mignet). At age 18 he returned to Paris where he studied at the Lycée Saint-Louis. After working at several low-level clerical jobs, he began to write a literary column for a newspaper. Controversial from the beginning, he did not hide his disdain for Napoleon III, who used the Second Republic as a vehicle to become Emperor. More than half of Zola's novels were part of a set of 20 collectively known as Les Rougon-Macquart. Set in France's Second Empire, the series traces the "hereditary" influence of violence, alcoholism, and prostitution in two branches of a single family: The respectable (that is, legitimate) Rougons and the disreputable (illegitimate) Macquarts, over a period of five generations. Zola's literary project in no small part resembled that of Honore de Balzac, whose Comedie Humaine signaled the emergence of a new literary movement, Realism. Zola was a leading proponent of the school of naturalism. Naturalism was an outgrowth of Realism, an attempt to take realism to new heights, or depths. Naturalism employed the same literary techniques as realism, but the rundown boarding house of Madame de Vaquer, which Balzac portrays in exhaustive detail in the first 30+ pages of Pere Goriot is positively palatial compared to the locations described in Zola and the other naturalists' texts. Naturalism is more "realistic" than realism in its efforts to portray the underside of society. Zola and the painter Paul Cézanne were friends from childhood and in youth, but broke in later life over Zola's fictionalized depiction of Cézanne and the bohemian life of painters in his novel L'Œuvre (The Masterpiece, 1886). L'Aurore's front page on January 13, 1898 features Émile Zola's open letter to the French President Félix Faure regarding the Dreyfus Affair. He risked his career and even his life on January 13, 1898, when his "J'accuse" was published on the front page of the Paris daily, L'Aurore. The paper was run by Ernest Vaughan and Georges Clemenceau, who decided that the controversial story would be in the form of an open letter to the President, Félix Faure. "J'accuse" accused the French government of anti-Semitism and of wrongfully placing Alfred Dreyfus in jail. Zola was brought to trial for libel on February 7, 1898, and was convicted on February 23. Zola declared that the conviction and transportation to Devil's Island of the Jewish army captain Alfred Dreyfus came after a false accusation of espionage and was a miscarriage of justice. The case, known as the Dreyfus affair, had divided France deeply between the reactionary army and church and the more liberal commercial society. The ramifications continued for years, so much so that on the 100th anniversary of Émile Zola's article, France's Roman Catholic daily paper, La Croix, apologized for its anti-Semitic editorials during the Dreyfus Affair. Zola was a leading light of France and his letter formed a major turning-point in the Dreyfus affair. In the course of events, Zola was convicted of libel, sentenced, and removed from the Legion of Honor. Rather than go to jail, he fled to England. Soon he was allowed to return in time to see the government fall. Dreyfus was offered a pardon (rather than exonerated) by the government, and, facing a re-trial in which he was sure to be convicted again, had no choice but to accept the pardon if he wished to go free. By accepting it, he was, in effect, saying that he was guilty, although he clearly was not. Zola said, "The truth is on the march, and nothing shall stop it." In 1906, Dreyfus was completely exonerated by the Supreme Court. Gravestone of Émile Zola at cimetière Montmartre; his remains are now interred in the Pantheon. Zola died in Paris on September 29, 1902, of carbon monoxide poisoning caused by a stopped chimney. He was 62 years old. His enemies were blamed, but nothing was proven, although decades later, a Parisian roofer claimed on his deathbed to have closed the chimney for political reasons. He was initially buried in the Cimetière de Montmartre in Paris, but on June 4, 1908, almost six years after his death, his remains were moved to the Panthéon in Paris. The biographical film The Life of Emile Zola won the Academy Award for "Best Picture" in 1937. The film focuses mainly on Zola's involvement in the Dreyfus Affair. In January 1998, President Jacques Chirac held a memorial to honor the centenary of "J'Accuse." Les Rougon-Macquart is the collective title given to Zola's greatest literary achievement, a monumental 20-novel cycle about the exploits of various members of an extended family during the French Second Empire, from the coup d'état of December 1851, which established Napoleon III as Emperor through to the aftermath of the Franco-Prussian War of 1871 which brought the Empire down. Almost all of the main protagonists for each novel are introduced in the first book, La Fortune des Rougon. The last novel in the cycle, Le Docteur Pascal, contains a lengthy chapter tying up virtually all the loose ends from the other novels. In between, there is no "best sequence" in which to read the novels in the cycle, as they are not in chronological order and indeed are impossible to arrange into such an order. Although some of the novels in the cycle are direct sequels to one another, many of them follow on directly from the last chapters of La Fortune des Rougon, and there is a great deal of chronological overlap between the books; there are numerous recurring characters and several of them make "guest" appearances in novels centered on other members of the family. All 20 of the novels have been translated into English under various titles (details of which are listed under each novel's individual entry), but some of the translations are out of print or badly outdated and censored. Excellent modern English translations are widely available for nine of the most popular novels in the cycle. Germinal (1885) is the thirteenth novel in Zola's 20-volume series Les Rougon-Macquart. Usually considered Zola's undisputed masterpiece and one of the greatest novels ever written in the French language, the novel—an uncompromisingly harsh and realistic story of a coalminers' strike in northern France in the 1860s—has been published and translated in over one hundred countries as well as inspiring five film adaptations and two television productions. The novel's central character is Etienne Lantier, previously seen in Zola's other masterpiece, L'Assommoir (1877), a young migrant worker who arrives at the forbidding coal mining town of Montsou in the bleak far north of France to earn a living as a miner. Sacked from his previous job on the railways for assaulting a superior—Etienne was originally to have been the central character in Zola's "murder on the trains" thriller La Bête humaine (1890), before the overwhelmingly positive reaction to Germinal persuaded him otherwise—he befriends the veteran miner Maheu, who finds him somewhere to stay and gets him a job pushing the carts down the pit. Etienne is portrayed as a hard-working idealist but also a naïve youth; Zola's genetic theories come into play as Etienne is presumed to have inherited his Macquart ancestors' traits of hotheaded impulsiveness and an addictive personality capable of exploding into rage under the influence of drink or strong passions. Zola manages to keep his theorizing in the background and Etienne's motivations are much more natural as a result. He embraces socialist principles, reading large amounts of extremist left-wing literature and fraternizing with Souvarine, a Russian anarchist and political emigré who has also come to Montsou to seek a living in the pits. Etienne's simplistic understanding of socialist politics and their rousing effect on him are very reminiscent of the rebel Silvère in the first novel in the cycle, La Fortune des Rougon (1871). Etienne also falls for Maheu's daughter, Catherine, also employed pushing carts in the mines, and he is drawn into the relationship between her and her brutish lover Chaval, a prototype for the character of Buteau in Zola's later novel La Terre (1887). The complex tangle of the miners' lives is played out against a backdrop of severe poverty and oppression, as their working and living conditions continue to worsen throughout the novel; pushed to breaking point, the miners decide to strike and Etienne, now a respected member of the community and recognized as a political idealist, becomes the leader of the movement. While the anarchist Souvarine preaches violent action, the miners and their families hold back, their poverty becoming ever more disastrous, until they are sparked into a ferocious riot, the violence of which is described in explicit terms by Zola, as well as providing some of the novelist's best and most evocative crowd scenes. The rioters are eventually confronted by police and the army, who repress the revolt in a violent and unforgettable episode. Disillusioned, the miners go back to work, blaming Etienne for the failure of the strike; then, in a fit of anarchist fervor, Souvarine sabotages the entrance shaft of one of the Montsou pits, trapping Etienne, Catherine, and Chaval at the bottom. The ensuing drama and the long wait for rescue are among some of Zola's best scenes, and the novel draws to a dramatic close. Beneath the blazing of the sun, in that morning of new growth, the countryside rang with song, as its belly swelled with a black and avenging army of men, germinating slowly in its furrows, growing upwards in readiness for harvests to come, until one day soon their ripening would burst open the earth itself. By the time of his death, the novel had come to be recognized as his undisputed masterpiece. At his funeral crowds of workers gathered, cheering the cortège with shouts of "Germinal! Germinal!" Since then the book has come to symbolize working class causes and to this day retains a special place in French mining-town folklore. Zola was always very proud of Germinal, and was always keen to defend its accuracy against accusations of hyperbole and exaggeration (from the conservatives) or of slander against the working classes (from the socialists). His research had been typically thorough, especially the parts involving lengthy observational visits to northern French mining towns in 1884, such as witnessing the after-effects of a crippling miners' strike first-hand at Anzin or actually going down a working coal pit at Denain. The mine scenes are especially vivid and haunting as a result. A sensation upon original publication, it is now by far the best-selling of Zola's novels, both in France and internationally. 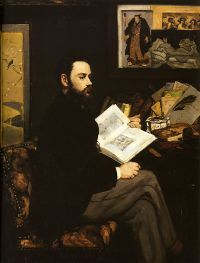 Works by Émile Zola. Project Gutenberg. 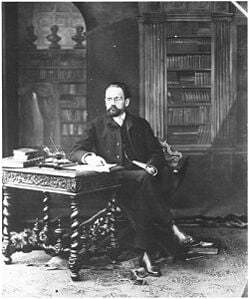 Émile Zola works: text, concordances and frequency list. The Rougon-Macquart Novels of Emile Zola (for English-speaking Readers) provides an American enthusiast's introduction, insights and synopses. This page was last modified on 27 September 2017, at 16:09.